I have heard that heating green bamboo produces a kind of natural resin which is extremely hard, very glossy and lasts almost indefinitely. I was wondering if anyone has tried using a propane torch to heat green bamboo, and as the resin comes out, wipe it off with a rag, and rub it into an existing shakuhachi.. Seems like a good idea, in theory. from my own experience in aburanuki (drying bamboo on a heat source) you just wipe the oil, it might make the column a bit more shiny but thats it, its not hard or anything since it dosnt have any thickness. urushi or maybe shellac sounds more like what you are looking for. I was thinking mainly of the gloss factor.. I'd love a way to try to get a high gloss finish with just bamboo resin..
Aloha Harry, The oil gums up quickly on the rag.when wiping during aburanuki. It would be difficult to transfer to another piece of bamboo. If you want to keep the skin natural, try polishing with buffers or with #0000 super fine steel wool by hand. Rub along the length. Rottenstone powder and a few drops of oil will also work for gloss. Rub it in, buff with a clean cloth. Repeat indefinitely until satisfied. Thanks, that makes more sense. I have some rottenstone. Perry you answered my question, I was wondering how possible it would be, but I didnt think of it gumming up and being hard to transfer. Also, I reckon, now that I think of it, the flute that I'd be trying to transfer it to would probably need to be heated too. Not a good idea to heat a shakuhachi? I'll try the steel wool and rottenstone. Not a good idea to heat a shakuhachi? To be honest, some years back I thought that if this liquid could became hard when dried, it could even be a good varnish for instruments like violin, guitar, and so... mind trips from the wacky backy youth!!! I think green bamboo would yield a lot of water as well as some oil.. probably pre-dried bamboo would be mostly oil when heated. Just use some walnut oil- two or three thin coats- wipe off the excess and wait a few days between coats - will not only shine it up, but make a good vapor barrier. Don't apply to much though at a time. The flute will get gummy. That's pretty awesome.. never heard of doing this. 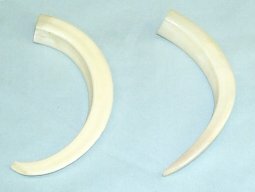 Where did you find boars tusks though? Plenty of boars on Kauai, Harry. Maybe some on your island,too. Oh yeah, that's true. Thanks! For some reason, I thought it had to be a special type of boar. ... Where did you find boars tusks though? Nah....I've heard that hippopotamus tusk works every bit as well. The more polished, and the larger the diameter of the hard object, the better the performance. That's why shiny ivory works well. I'll try it with my mammoth ivory. Yes, but...the larger the diameter, the harder you have to press (since the force is less concentrated) and the more difficult to get into small and tight places. But too sharp and it will start to mark or tear the bamboo. Do you just happen to have some lying around or do you actually use it in some sort of a craft? If you have a good source for buying it please let me know.